For the last couple of years we’ve been hearing and reading about the National Museum of Play at The Strong, known to the Rochester locals as “The Strong”. I couldn’t see how one museum would be worth the 3 plus hour drive to Rochester, hotel stay and expense? But I was so wrong. At over 280,000 square feet, the National Museum of Play is the largest regional year-round family attraction and the second largest children’s museum in the nation. Each corner will excite your child and you and you’ll be glad for your weekend away in Rochester! I’ll highlight a few of the major areas and why we loved them. Families are greeted to this down right fun section by a full size mama, papa, brother and sister bear. This section is great for kids who’s nighttime routine includes books about life in Bear Country and want to experience the Bear Country School, the Family Tree House or Farmer Ben’s Farm on their own. There are lots of fun slides, play areas and building blocks in this section geared towards the preschool crowd. 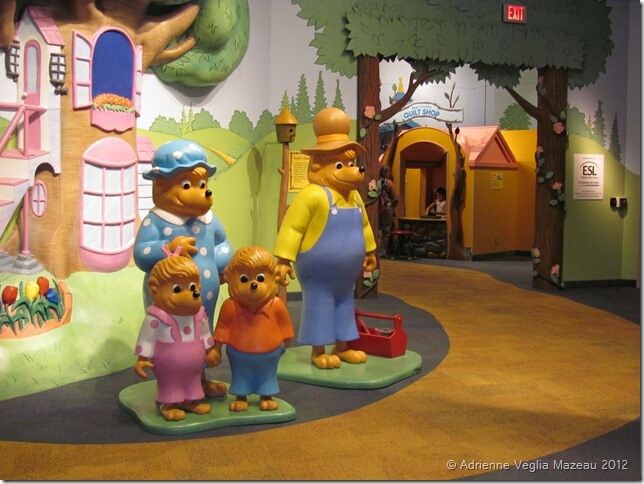 Tip: The entrance to the Berenstain Bears exhibit is next to the alluring gift shop. Picking up young kids or strapping them in stroller as you walk by is very helpful in order to get to the exhibit without a meltdown. 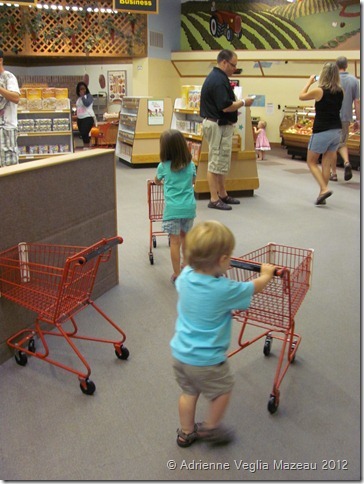 One of my favorite exhibits at the Strong was the kid sized Wegmans supermarket. If you’ve never been to a Wegmans that’s an experience you will not forget as it truly is the BEST grocery chain! The child sized version comes complete with miniature shopping carts, produce, cheese, bakery, seafood and meat sections. Kids can select up to 5 items that can be scanned on one of the working check cash registers. Walk down the yellow brick road and climb through a pirate ship for a whimsical adventure through five literary landscapes. Kids can make their own witches hat and magic potions in the Wizard’s Workshop, while sitting in front of Gandalf’s staff, or climb up Jack’s beanstalk to a giant castle. 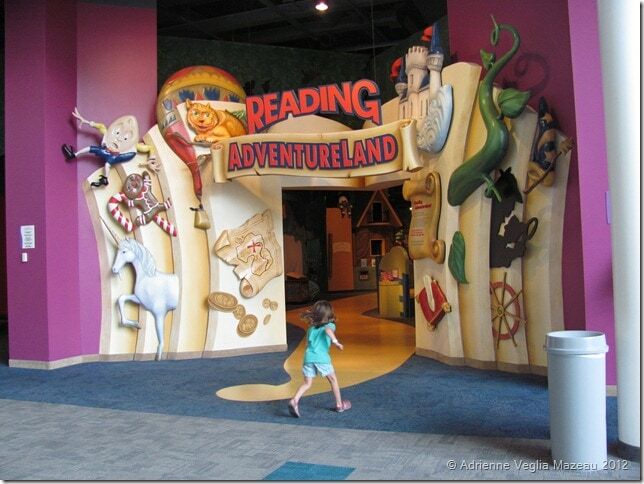 Combining a mix of sensory fun in activities like the snow box (a version of a sandbox), to seeing culturally different versions of Cinderella to the various arts and crafts stations, the Reading Adventureland is a real treat. Tip: Each section of the Strong is filled with children’s books related to that area. For members of the Monroe County library system, books can be borrowed from the Strong as they would be from any other library in the system. Locals can read books in different sections of the museum then bring them home to keep the adventure going! You’re little superhero will find all of their favorite comic book heroes from Batman to Iron Man plus you can explore the history of superhero comic books in the United States. This is a fun exhibit for kids and parents. Where else you fight evil and walk up the side of a building all while snapping a picture that can be emailed home! 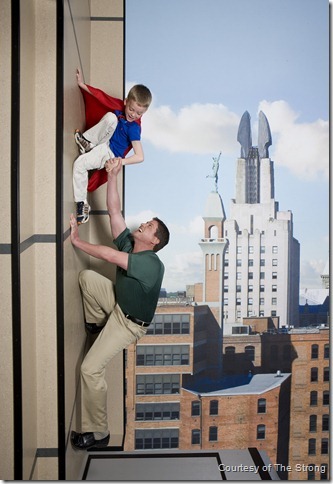 Kids can enjoy dressing up like their favorite superheroes and test their skills at Super Power School. For the Sesame Street Elmo crazed kids this is the place! Walk through the colorful Elmo’s World, take pictures on the famous stepped façade of Sesame Street, drive Elmo and Cookie Monster (in booster seats of course) around in a yellow cab and let your child see themselves on TV with their favorite characters. We couldn’t get our Ernie obsessed toddler to leave this area! There is so much more to see at the National Museum of Play that I could only highlight a few. Included with admission is the National Toy Hall of Fame which covers everything from the Slinky to Candy Land. Each November new iconic toys that have achieved national significance are inducted into the Hall of Fame. This is a fun trip down memory lane for moms and dads. For an extra charge, your family can walk through a year round indoor butterfly garden, take a ride on a carousel from 1918 or ride on The Strong Express passenger train. I loved this museum! Not only are the exhibits amazing but The Strong takes parents into account as well from signs in the bathroom for parents who are desperate for a clean outfit for a child who just had an accident, to the areas for nursing moms discreetly off of the main exhibit space. I’ve been to children’s museums that haven’t come close to comparing to The Strong and paid A LOT more for admission. 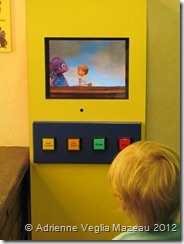 The Strong National Museum of Play is a great value and a day well spent. Disclosure: Our visit to Rochester was hosted by Visit Rochester. Adrienne, thank you for the reminder that it is time for us to head back to the Strong Museum. We have not been there in a few years and a lot has changed. The reality is that there is so much to see there that you could go back again and again and have a different experience. I now know why so many people in the Rochester and Buffalo area have memberships there.